This weekend Chris and I went to his New Illinois Fruit and Vegetable Farmers class. It was a gorgeous day filled with sunshine and a picnic lunch at U of I. It was also a whirlwind, but it sparked a lot of ideas and hope for our farm this year. In our basement, we also began transplanting our tiny seed starts. We are behind where we should be, but we feel we’re starting seeds better this year than any other year before. We’re also learning how to do things on a larger scale. 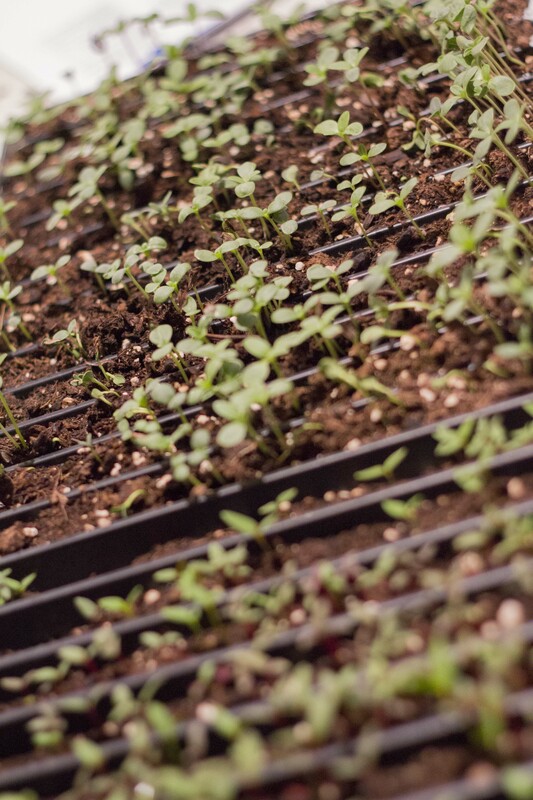 For example, we have 350 zinnia plants that will roughly produce thousands of zinnias. And that doesn’t even include what we’ll direct seed into the ground. Our chickens have left the adorable newborn stage and are now entering the awkward teenage stage. They’re about four weeks old. So is the photos of the chicks representative of the two breeds? Yes. The first photo of the yellow chicken is a Buff Orpington. The second photo is the Barred Rock. This particular Barred Rock is a little yellow compared to the other Barred Rocks. It will be interesting to watch her grow!